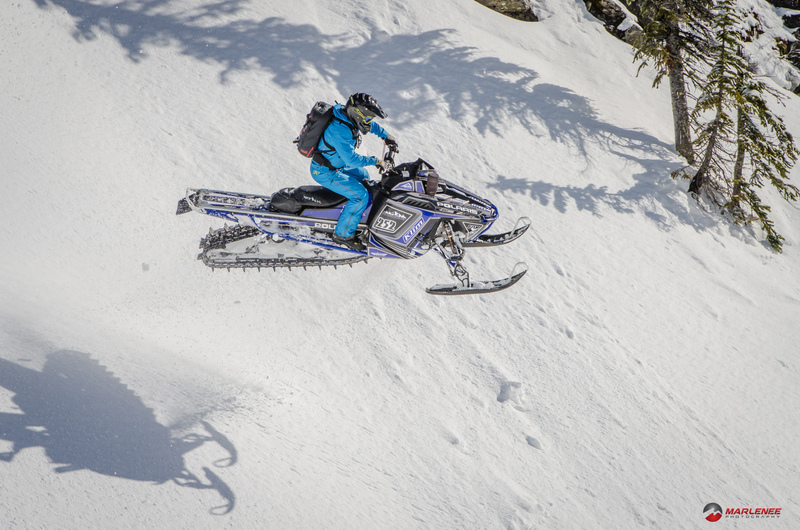 You know it’s getting close to a new season when you get that first whiff of the hot-off-the-press Klim catalog. This year, that first taste is electronic, but it tickles the sensations just the same. As for the link to the actual catalog, you can find it HERE. For me, this catalog means a lot more than just the start of a season and the time honored tradition of picking out new gear. This year, I was asked to help, throughout the season, supply content and work with the riders as this gear came to market. It meant that I got to work with industry talent like Matt Entz, Chris Burandt, Dan Adams, Cole Willford, Adam Onasch and many more. And, much to my delight, it means that my pictures will be seen by hundreds of thousands of snowmobile enthusiasts across the globe. On a random Sunday, I got a call from Adam Onasch and Kim Long. They wanted to hit up Montezuma, CO, a small nearly ghost-town outside of Keystone, CO. We were chasing a late April storm and had spent the early morning checking Snotel and the ski resort stats. After much deliberation, we decided that Monte, as it is affectionately known, was the best option. We drove the short 15 or so miles from Adam’s house and unloaded in a makeshift parking lot. The trail in is easy and untraveled. As we approached tree-line, a heavy fog set in. We spent nearly an hour trying to navigate around, and almost called it a day. Just as we consumed the contents of our muff-pots, mine being hot-pockets, and Adam had Totino’s pizza rolls, the clouds began to lift. The snow was weird. The top 3-6 inches were a dense powder, most likely deposited by gale force winds. Underneath was an entire season’s worth of condensed snowpack, the consistency of a glacier. Adam scouted this wind-lip and lined up for the shot. I climbed up the off-camber sidehill and set up. This was Adam’s first attempt, and he nearly wiped me out! 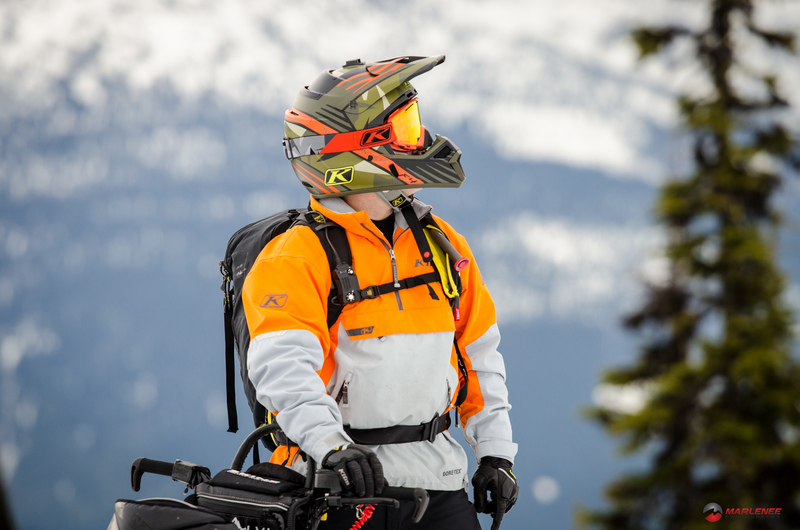 All of these photos came from a trip to Revelstoke, British Colombia, Canada. 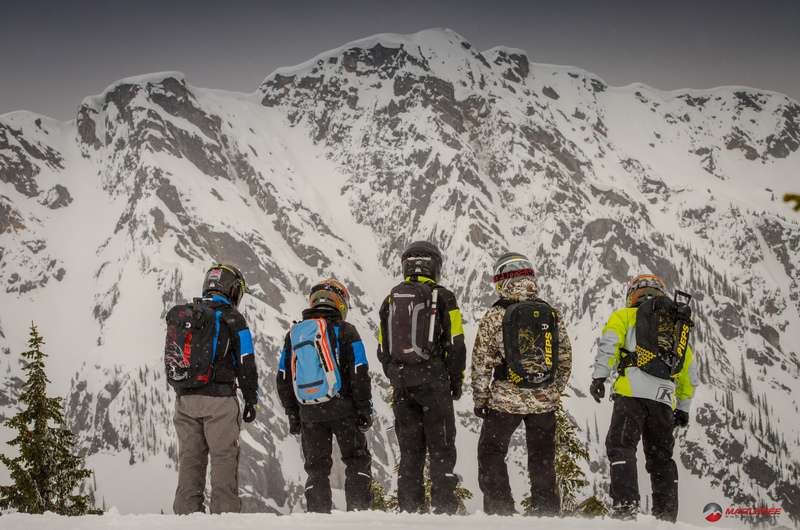 As the 14-15 season came to an end, I caught an invite from Jim Phelan of Thunderstruck Films to join him and the crew in Revy. To be honest, the decision was completely last minute, and one of the many on-a-whim exercises of that season. 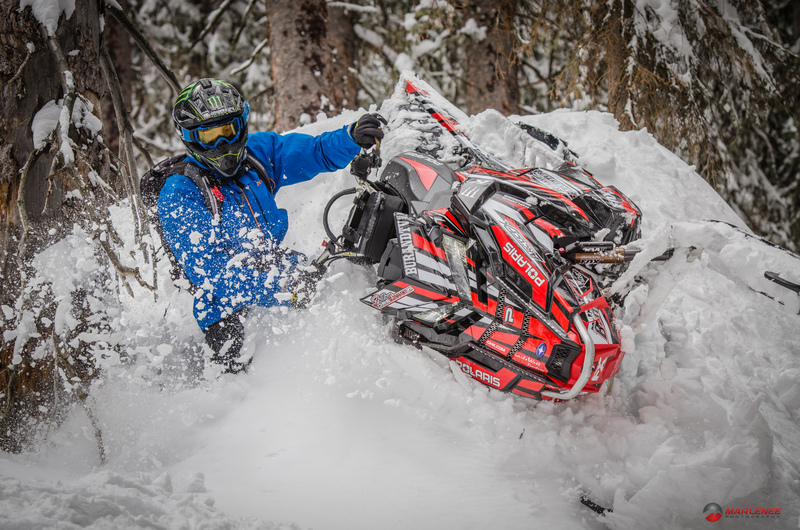 For the full details of the trip, get yourself a copy of the 2015 SledHeads Photo Annual from Harris Publishing this fall! After an exhausting 20-hour road trip from Rabbit Ears, CO (Steamboat) to Revelstoke, BC, I had one thing on my mind: to capture as many photos and moments as I could. What started out as a usual Thunderstruck filming trip had morphed into a industry spectacle to close out the season. 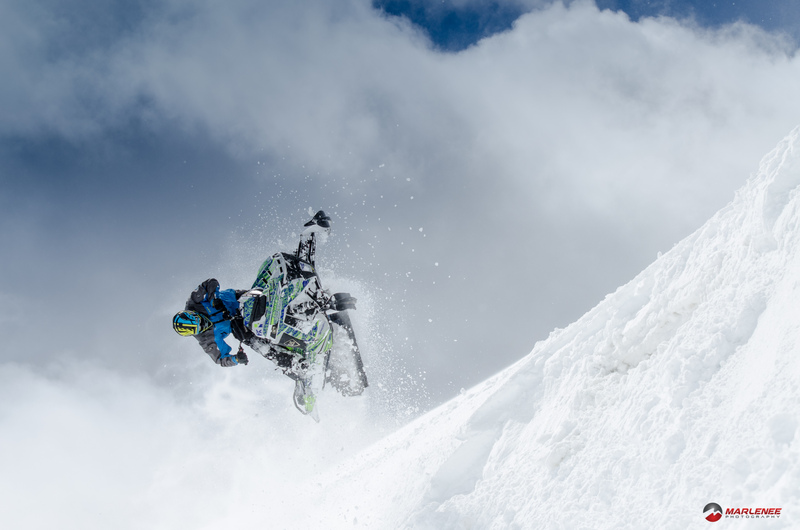 Sid and the Klim crew (Matt Entz, Dan Adams, Adam Onasch and more) had joined up with Jim Phelan and the Thunderstruck crew (Trennis Baer, Randy Swenson, Rozzy, Mark Mesenbrink and more) to slay the Canadian Rockies. For many of us, it was the first time we’d ridden together, and for half of us, it was the first experience to Revy. 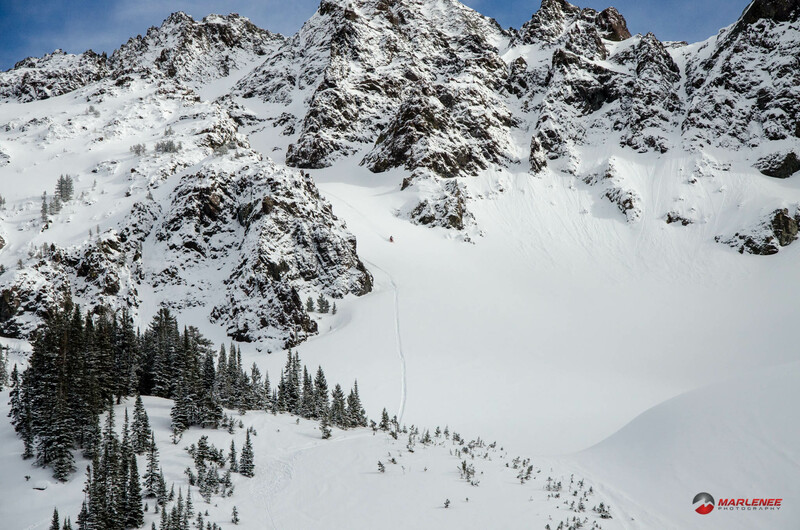 Matt Entz and I had driven from riding with the Boondockers Film’s crew in Colorado, swung through Idaho where we joined up with Sid Huntsman, Dan Adams and Jared Sessions, and continued the last 12 hours to Revy. Adam and Kim drove a different route, that put them through central Montana and across the Missouri River breaks. Revelstoke was a trip that I’ll never forget. Jim is a true mentor, and it’s jaw-dropping to see what the Thunderstruck riders are able to navigate. On what was to be my last ride of the season, I couldn’t have asked for better. I had gotten a call from Matt Entz Friday night in late May. He was filled with excitement as Southern Colorado had been getting pounded with another late-season storm. Snotel was up nearly a foot in the past 24-hours. 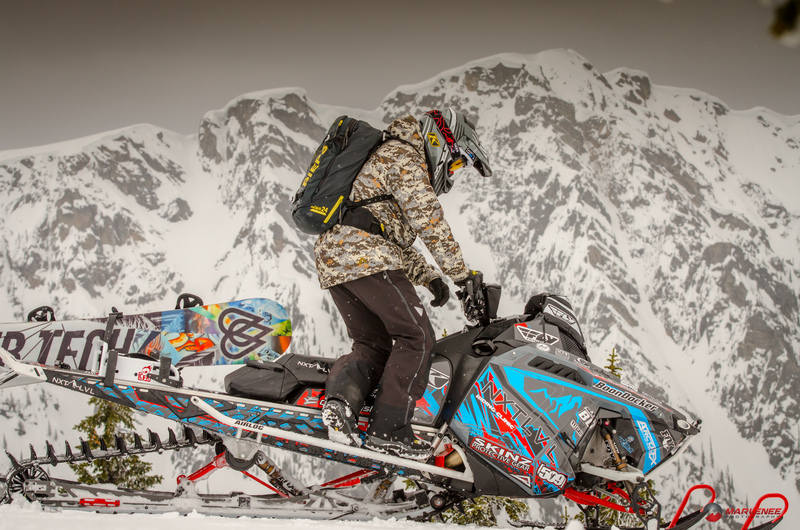 I scurried to load my gear and sled, to the disappointment of my neighbors. As I made the trek to Wolf Creek, Matt called and said that he couldn’t ride Sunday. I had to make the most of the 12-hour round trip, so I called up Chris Burandt. 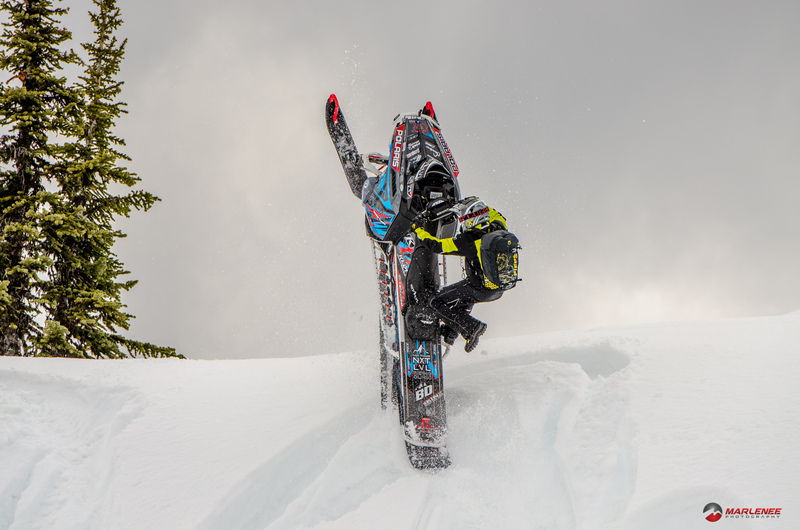 It had just been announced that Chris was joining the Klim team, and I was sure that there wouldn’t be much for content with him in Klim gear, so it seemed like a good fit. I relayed the info from Matt about snow totals, in hopes to lure Chris into a ride. I also texted Cole Willford in an attempt to do the same. It didn’t disappoint. The snow started the day as fluffy white gold. It was incredible to watch Cole and Chris dance the ballet of beasts, throwing their 1/4-ton machines around, ever so gracefully. This shot was actually completely set-up. I spotted this knoll as we were taking a break, and asked Chris if he could come over it and throw a shoulder down. Chris executed it perfectly, and I’m happy to say it was a great shot! Every year, I do a friends and family trip to Cooke City, MT, usually at the end of February to coincide with my brother’s birthday. This year was no different. However, as the years go on, the friends and family has grown considerably. This shot is of Carl Christensen, a Thunderstruck rider that swung down from Helena. A large group of us were hitting a wind lip at the bottom of this chute when Carl opened the throttle on his SpeedWerx supercharged kitty cat. What you couldn’t see, from the bottom, was the camber and wind-lip behind the rocks. Carl came down, sweating and white-knuckled. He told us of his near-perilous experience, and we all had to peek around the corner to check it out! I was stranded in Gillette, WY. I don’t remember why I had my sled, but I was ‘working’. 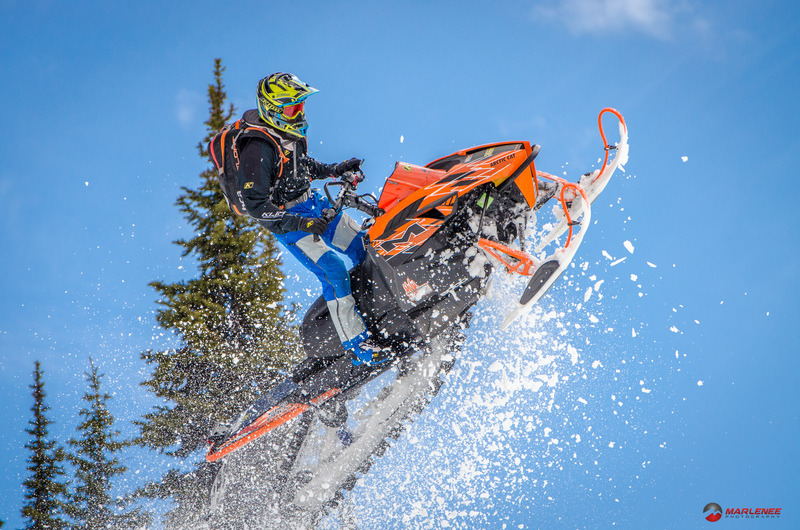 A winter storm warning had been issued for Cooke City, MT and I was itching to ride. Thursday afternoon, I threw it out on Facebook, that I was in Gillette and heading to Cooke, if anyone wanted to ride. Kristy Harnish answered the call. 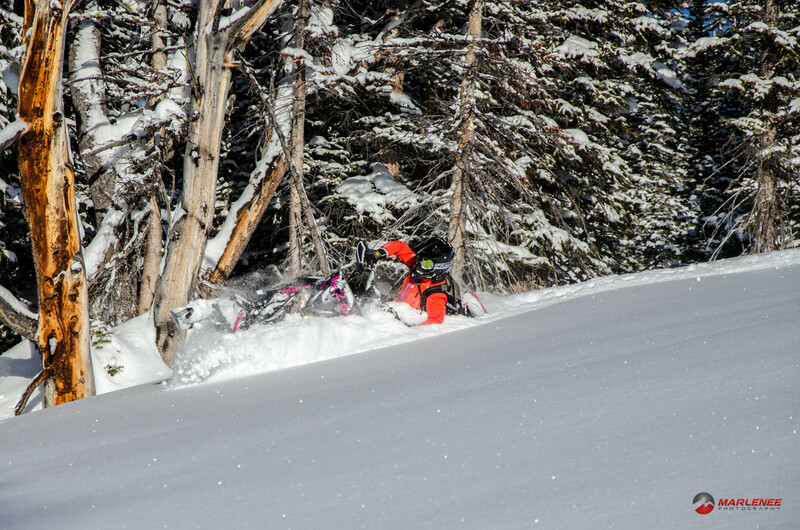 I had never met or heard of Kristy, but she is a Klim athlete, and I’m not that picky about riding partners; I was glad to have the company. The snow wasn’t as good as the three-feet that the NWS had promised, but it was still bumper-deep. 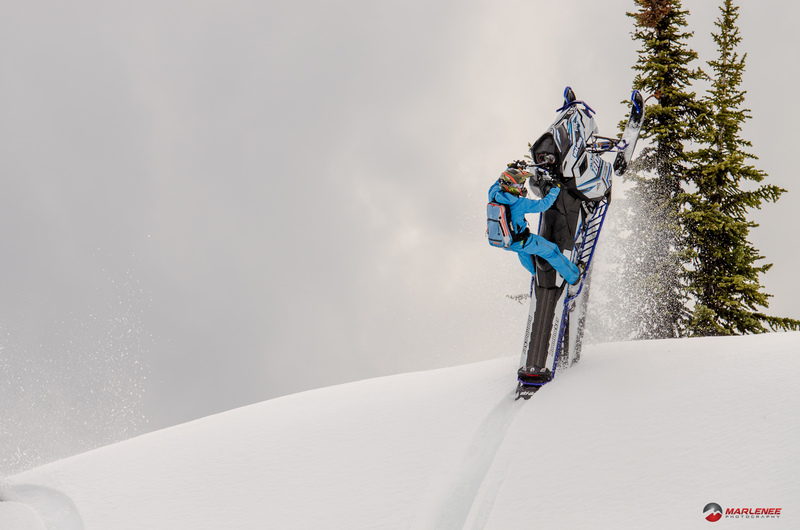 I got to spend a great weekend filming her tearing up the back country on her custom-Braap-Wrapped Ski-Doo. This shot is just up Lulu as we played our way to the top of the pass.